For over 40 years, B&R Machine and Gear Corporation has been providing small-batch, high-precision gearing. It prides itself on offering personal customer service while leading the industry as a full-service gear manufacturing facility. A method is presented to characterize premium quality clean steels using statistics of extreme values (SEV) and quantitative stereology. The data can be used to perform gear design relevant engineering analysis of the potential for a gear failure due to bending fatigue in the root or flank or rolling/sliding contact fatigue of the gear tooth face. This paper suggests two ways to calculate a load reversal factor that would be material-specific, based either on Modified Goodman or Gerber failure theories, and further provides a method of calculating the reliability factors that closely match the AGMA tables found in ANSI/AGMA 2101-D04. There have been 40 years of fascinating projects, unforgettable facilities, and forward-thinking people in the gear and heat treat industry. Corrosion in the gear manufacturing process is a significant issue that must be corrected to avoid premature failure. 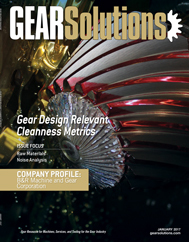 Gear Solutions talks with company leaders so they can share their experiences in the industry. We had a chance to sit down with Matt Croson, AGMA’s new president, to learn more about him.